One of the jokers with the most interesting history is this one. 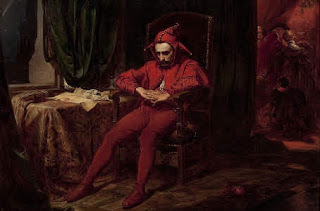 The joker is derived from a famous enigmatic painting by Jan Matejko in 1862. In the painting there is a distraught brooding court jester who contrasts dramatically with his character and the court ball visible in the background. The painting is about a specific court jester and moment in history. Stańczyk is the jester and the year is 1533 (OK, there's some debate if the jester is mythical or historical and the date seems to be also up for discussion). 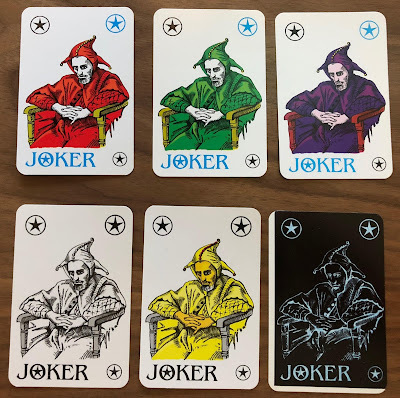 This joker seems to come from Poland and there are versions of him in several colors. And thanks to Ronald Kruijmel of the FB Joker Collectors Club for cluing me in to the origins of this joker.